Governor Ricketts tells the legislature to “Keep your paws off of pet healthcare”. Governor Ricketts joined Nebraska veterinarians and animal advocates to voice disapproval of the legislature’s proposed tax on pet and livestock healthcare. It is being proposed alongside several other sales tax increases on Nebraskans. 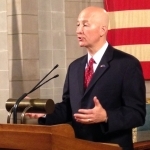 Governor Ricketts repeated his message to state senators to instead focus on controlling spending to deliver tax relief for all Nebraskans instead of taxing one group of people to give to another.